Today I was cleaning out my pantry. In my bread basket, I found a package of english muffins. I was horrified. I was horrified because I had purchased these particular english muffins more than a month earlier…and they were still “fresh”…no mold to be found. Ick. How many chemicals did they have to pump into those english muffins to accomplish that? Horrified. 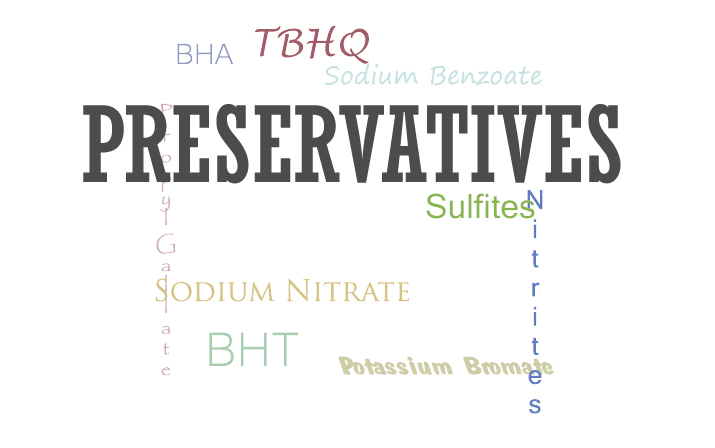 Preservatives are added to foods to extend its life, by preventing bacterial or fungal growth or preventing oxidation, which leads to discolorization or rancidity. Preservatives are also used on some produce to delay spoilage. BHA/BHT: Used in foods high in fats, cereals, baked goods, chewing gum, potato chips and meats. Keeps meat from discoloring, keeps food from going rancid. These cause cancer in lab animals and the U.S. Dept of Health classifies it as being “reasonably anticipated to be a human carcinogen”. Some countries have restricted or banned their use in food. Propyl Gallate: Used in high-fat foods. It is also used in cosmetics and toothpaste. It inhibits oxidation in oils. This is a suspected carcinogen that has been banned in many countries. It also increases estrogen levels, can create stomach irritation, skin irritation, and asthma attacks. Sodium Benzoate: Used in beverages, pickles, salad dressings, jams & jellies, margarine, pre-made burger patties, fast food hamburgers. Although research is currently inconclusive, some evidence shows that when sodium benzoate combines with vitamin C (found in many soft drinks and jellies), it forms benzene, which is a carcinogen. It has been linked with hyperactivity in children, as well as DNA damage. Sodium Nitrate/Nitrite: Used in cured meats, including bacon, smoked sausage, deli meats, hot dogs, etc. Prevents bacterial growth and discolorization. Nitrate is a natural salt. Synthetic nitrite is nitrate that is chemically processed. Nitrite is more worrisome than nitrate, it is a known toxin in high amounts. Both can combine with chemicals in the stomach to create nitrosamine, a highly carcinogenic substance. They also create nitrosamine when charred, like when you grill your hot dogs. It is also possible that the curing process itself turns some of the nitrite/nitrate into nitrosamine. Nitrite has been linked to migraines, COPD, neurological conditions, diabetes and behavior issues in children. Synthetic nitrite is allowed to contain heavy metals, lead and arsenic. If you have a history of cancer in your family, you would be wise to avoid this. It is important to note that nitrite does naturally occur in some foods, especially vegetables. You can find “uncured” hot dogs, sausage and bacon that instead use celery juice in the curing process. These are still cured, but do not use the synthetic nitrates. There is still a possiblity the body reacts the same way to the natural nitrites as the do the synthetic…but if you MUST have bacon (and…sometimes we must), “uncured” bacon is definitely a step or two up. Sulfites (Bisulfites/Metabisulfites/Sulfur Dioxide): Used in wine, dried fruit, dried potatoes, and bottled lemon juice. It inhibits bacterial growth and fruit discolorization. Some people are allergic or highly sensitive to sulfites. It may cause breathing problems in those who are sensitive. It is also known to destroy vitamin B1, which is needed to metabolize carbs and alcohol. If you have weird reactions to various foods, sulfite sensitivity may be the culprit. TBHQ: Used in oils, high-oil foods, and frozen fish. It is shown to have negative affects on lab animals in high doses, such as DNA damage and tumors. Studies contradict and more studies are needed before it is labelled a carcinogen. There is strong evidence that it is related to stomach cancer.